Daily Illuminator: This Issue Scores A Bullseye! July 22, 2013: This Issue Scores A Bullseye! In modern gaming, most heroes use guns to keep the peace -- and when it comes to weapons and gear, more info and intel is always better. It's in that spirit that we present Pyramid #3/57: Gunplay, the latest issue of Pyramid. 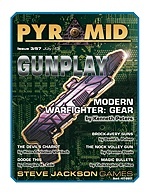 Our bullet-pointed list of six shots includes a huge assortment of new GURPS gear and modern military insight from GURPS Ultra-Tech co-author Kenneth Peters, details and stats for the sure-shooting Mi-24 helicopter -- and armaments -- from GURPS Tactical Shooting's Hans-Christian Vortisch, and David L. Pulver's fictitious arms manufacturer (including their wares throughout the ages) ready to be dropped into nearly any GURPS gun-toting era. It also comes with an alternative look at dodging, expanded exotic bullets, and more. This is one loaded magazine, and there's never been a better time for a gun-themed issue than the numerologically appropriate Pyramid #3/57! Pick up this issue individually, or start your subscription today and keep yourself stocked!